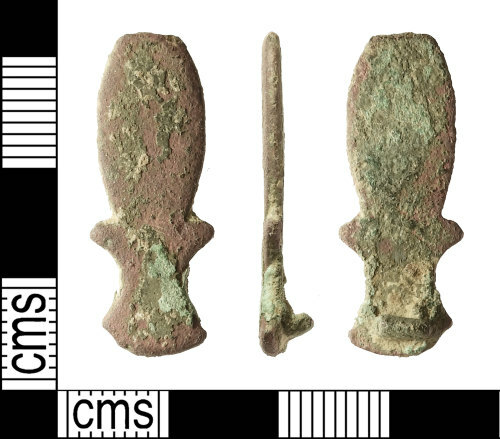 An incomplete post-Medieval copper-alloy mount (c. 1600-c. 1700). In plan, it is oval with a pointed knop at each side. From the knops the sides taper inwards and then flare outwards to a curving terminal. The reverse is flat except for the stub of an integral spike at the terminal end. This mount is reddish brown with green corrosion products and traces of a green patina. Length: 29.3mm; width: 10.0mm; thickness: 1.6mm; thickness including spike: 4.2mm. Weight: 3.03g. Compare with IOW-53602A and PUBLIC-B44769.